$11.95 ea. In Stock These Art Asylum 2002 Star Trek Enterprise Klang 6 1/2" tall action figure is mint on a near mint still sealed card, it comes with a Bat`leth klingon sword of honor, disrupter, ceremonial knife & Enterprise logo base, extremly detailed. $14.95 ea. This 2003 Hallmark ornament is mint in a near mint box,has never been out of the box,Capt. Archer is seen here sitting in the Captains chair as seen in Enterprise on the Enterprise NX-01 bridge,only have a few availible. 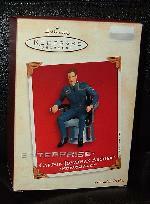 Item #85205 Art Asylum-Star Trek Enterprise-Broken Bow-Silik Action Figure $11.95 ea. 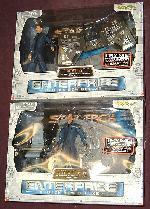 In Stock This Art Asylum 2002, Star Trek Enterprise-Broken Bow Silik the Suliban 6 1/2" action figure is mint in near mint packaging, it comes with 2 Suliban hand weapons, 3 pairs of hands & Enterprise logo base.